TV glasses make it possible to enjoy your favorite TV programs - whether it is a baseball game, a movie, or your favorite sitcom..
A favorite past time for those with macular degeneration is watching TV. My father-in-law loves watching the Milwaukee Braves baseball games and we know to never make a call when a game is on. 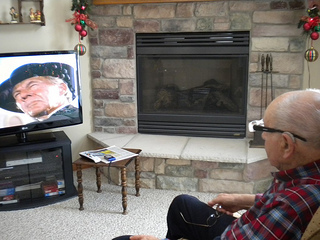 His dry macular degeneration has turned to wet and his central vision loss has made TV watching less enjoyable. 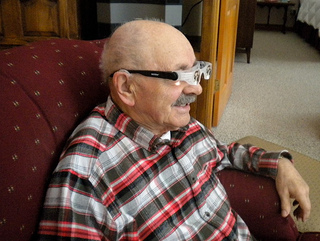 Normally, he would pull up his chair real close to the TV, but now thanks to these television glasses he can see faces of players, baseball scores and even the tiny numbers that reflect the time and temperature on the bottom of his screen. Today's TV's with high definition technology and the affordability of larger screens makes television viewing a whole different experience than just a few years ago. The brilliant colors and sharp details are just what those with macular degeneration need. First try sitting closer to the TV screen. If you have a scotoma and you are sitting far from the TV, the grey or black spot may take up a large part of your TV viewing. Sitting closer will reduce the viewing size of your scotoma allowing you to see more of the TV. "I don't have to sit so close to the TV." "The TV is no longer blurry." "I can see the baseball score." As you can see from the picture there is a small dial that is used to focus the glasses. Because everyone's vision is different in each eye, the glasses allow each eye to be adjusted separately to get the best clarity. These distance magnifiers maximize the size of the TV and are intended for watching events, movies, or sports. They are not for reading or for close up work. These lightweight macular degeneration glasses make your TV screen appear twice as large. For the best results sit at least 3 feet away from the TV. Another feature is that each eye lens can be individually focused. 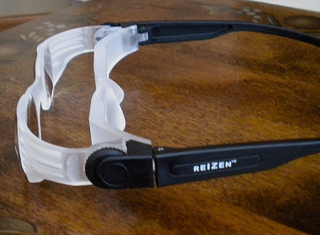 These TV glasses use magnification to enlarge the image, so it appears closer. No need to sit right up close to the television anymore. Just put them on as you would a regular pair of glasses. You are able to adjust the focus wheel on each temple until the image is right for you. Have you ever been in the middle of an exciting TV show or movie, and needed to turn up the volume, only to change channels instead? Of course if anyone else is in the room watching with you everyone starts to freak out, while you try to explain that it was an accident. With large buttons and large numbers this style TV remote is easy to see and use. Pay attention to the different descriptions as some of these remotes work only with TV and not with satellite or not with a cable box. The most popular remote with the highest ratings at Amazon is the Flipper Remote. It has different color buttons making it easier to distinguish the volume controls from the channel controls.